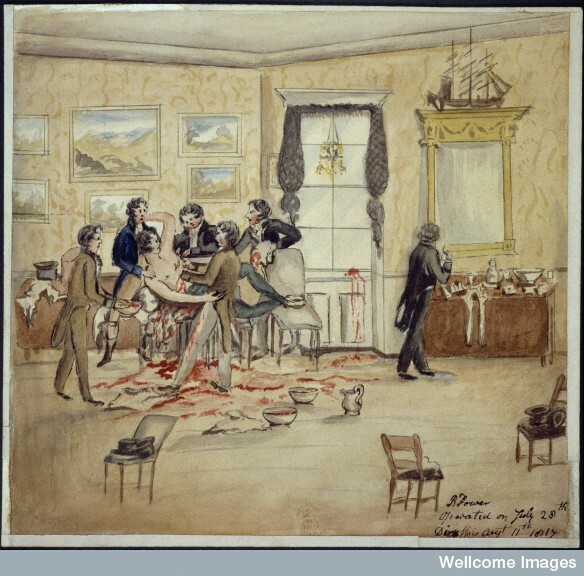 A surgical operation to remove a malignant tumour from a man’s left breast and armpit in a Dublin drawing room, 1817. Watercolour, 1817. This entry was posted in Uncategorized on November 10, 2015 by Lydia Smith. I named my first Bacteria Bibi, because it starts with a “B” just like Bacteria. I started in Brazil, because I thought it was a pretty easy target for the over crowded population and their hot climate. However, it took a while to start infecting within the same country. I chose my transmission to be Birds because it’s an easy way to spread a disease worldwide. I chose my ability to be Heat Resistance because Brazil is known for its very hot climate, and that way the bacteria would spread faster. And one of the symptoms I chose was Coughing because it can lead to other symptoms such as pneumonia and other pulmonary sicknesses. As the bacteria starts spreading and infecting more people, wealthy countries start doing research to find a cure, and that’s when I chose other abilities such as drug resistance so the bacteria doesn’t stop spreading. The game became very entertaining and somehow addictive. It takes a lot of planning and decision making. With that being said, my first bacteria Bibi wasn’t very successful. It took her about 3 years to kill most of the population. The only countries that were not infected were Iceland and Greenland. I tried choosing other abilities such as Cold Resistance but it still didn’t work. However, this first game gave me some experience for the second round. My second bacteria was Boby, he was a killer! I started Boby in Germany. A wealthy country in Europe, surrounded by other wealthy countries. Boby started to spread all over Europe. And I chose the same transmission as the first game, Birds. I chose my first ability to be Drug Resistance because since Germany is a wealthy country they have access to drugs to stop spreading it. And I chose the same symptoms as the first game, coughing. While Boby was spreading I started using my DNA points to choose abilities such as Genetic Hardening to stop the cure process that was going on in Europe. Boby unlike Bibi infected Iceland and Greenland. It destroyed all the countries in 1 year. My score was 2960. I had a very good progress because my score with Bibi was 67. I like this game a lot. I usually don’t download games on my phone. But I’ll be keeping this one, because it’s very entertaining and I learned so much about the spreading of diseases. The name of my disease is buryem in first game. I started from Brazil as an accident so I chose it as a poor nation. Brazil is surrounded by lots of water which I believed could increase the possibility of transmission and death. First 100 people were affected within 10 minutes, I believed I was definately on to something. The first million people were affected within 30 minutes. The infection began spreading around the world soon thereafter. My mode of transmission was through the air and water . It spead so fast but the first death occurred within 1 hour and . I think the virus was not strong enough to kill and destroy much of the human race. In the end a total of 977 people died. In the end cure for the virus was at 15% and is estimated to be available in over a year. That seems very long. The virus did not spread to Greenland , Finland,Sweden , Baltic States or Canada. . The virus spead everywhere else in the world. Total people infected worldwide was 6,177,504,045. It is just amazing how fast the virus spread. As a wealthy nation I chose Sweden and named the Disease Buryem 2. IT took way longer to spread. I believe it took longer because of the more advanced health care. It took over 30 mins to spread to 100 people. Did not affect 1,000, 000,000 people yet. Both games proved that diseases are more likely to spread in poorer unsanitary environments. Don’t think I really grasped the game fully because I would have definately mutated my disease to wipe out the world but It has helped me to understand pandemic transmission. This entry was posted in Uncategorized on October 25, 2015 by SanicaLyn RN AAS.. I named my bacteria ‘copox’. 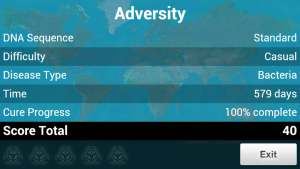 At a casual level of dificulty, i must say that it was quite interesting to play, and eradicate the entire human race. I started in a poor nation , India. I used the DNA points to speed up the transmission. As India has hot weather and a heavy mansoon season I picked the mosquitoes as the primary route of transmission, eventually adding more means of transmissions. The first death occured on 10-12-2015, which was only ten days after the transmission. The infection spread to china, and pakistan and the other neighboring countries. Copox had killed 100 humans by 10-13-2015. Infection was spreading to all the continents via the air travel and sea routes. Research for the cure of Copox was not a priority until it started infecting countries like the U.S.A and U.K. I tried to add on to the symptoms and abilities by increasing the drug resistance. Greenland was the last to get infected and deaths occured slowly.Human race finally ended after fighting the deadly disease for 704 days. The cure had only progressed to 71%. In the second game, I named by bacteria B2Z2. This time the disease process began in a rich country , U.S.A. The infection began to spread on 10/19/2015, slowly but steadily in the states, spreading first to Egypt and China. Months later,it was 2/14/16 and there was still no death in the states. The first death occured in Egypt and then Mexico. Once it started to kill, the disease spread faster to other nations and continents quickly. I realized that the research on the cure for B2Z2 was much faster that the Copox. The death rate got faster only after I increased the drug resistance , this is when people in the states began to die.The rate of infection was upto 65% all over the world. Just like the first game, Greenland was the last to get infected due fewer modes of transportantions, and that occured on 1/28/2017. BY 3/13/2012, there were no healthy people living on the planet. But cure was found by any and every means possible , even if they had o use human subjects. B2Z2 was eradicated after 644 days of strong fight against the disease. Humans were victorious. This was a very informative game , it was fun to win, but not so much, to realize that this game may beacome a reality. We can face extinction just like many other species have. It was interesting to see how infection spreads and see the comparison between a rich and a poor country. This entry was posted in Uncategorized on October 20, 2015 by Reem. The Black Death or the Bubonic plague occurred in Europe around the Middle Ages, it was an epidemic in the sense that it had almost wiped out the entire European continent as millions of lives had succumbed to this devastating infectious disease. The onset of the disease to humans believes to have started when infected fleas from dead rats had been in contact with the human population. In the aftermath of this pandemic, there are still some important things to ponder about the Bubonic plague. For instance, when looking at the interactive map of the infected cities, from my perspective, the plague was first spotted in Messina, Italy which is located in the island of Sicily, and then the spread of the disease had conquered most of the continent, which concluded that it is somewhat likely that the plague had entered Europe though the Genoese trade route and sweep onward to the rest of Europe. Also, it is important to realize that the plague had traveled more quickly along shipping routes than overland since the plague originated in Asia and entered Europe by ships through trades between both continents. Also, we can deduce that the plague did not travel overland into France, since it had reached Valencia first, then Paris as there is a large body of water that borders both cities. Therefore, it would have been most likely spread by ships. Then, the path of the plague took so long to reached London when it was already nearby Paris is due to the fact that Britain is an island and it is almost isolated from the rest of Europe, plus France and England were never the best of friends, therefore relations were probably stiff and there was a low probability of people migrating there that could have contributed to the rapid spread of the disease. As a final point, I believe the interactive map helped me better understand the transmission of the Bubonic plague, since it gave me a starting point, where the disease may have entered Europe and the cities it had wreaked havoc on in that part of the world. This entry was posted in Uncategorized on October 19, 2015 by Jean Yves Mercredi. My bacteria is named Yoshi, and Ollie after my pet Conure and Cockatiel respectively. I’m new to the game but read through the instructions that are part of the game. I focused on transmission first and for most, before I evolved any symptoms, so I can go unnoticed. 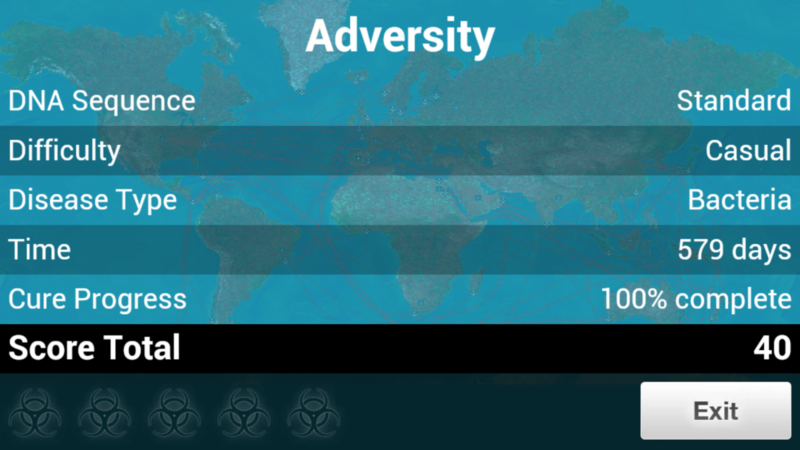 Once the world was infected I spent my DNA on symptoms and cure resistance. I didn’t realize I could devolve the free symptoms until the second round. Yoshi originally started in India. It took 45 days to infect 100 people and about 90 days to infect 1 million people. I focused on transmission I played with the insect and bird to help transmit the bacteria over land boarders. I also used air and water. Since I did not use any DNA points on symptoms, my first dead took 1year 7 months, but since everyone was infected it was all downhill from there. Total organ failure, and by chance the walking dead combo appeared. Cure rate 35% Total 729 days. Ollie began in the U.S. It took only 15 days to infect 100, and 6 months to reach 1 million. Since it started in the U.S. I received a text bubble that medicine is slowing the transmission rate. I upped the drug resistance I, and II as to not have a cure made before the total infection of the world. This time I only used air, and water transmission until I maxed out at Bio-Aerosol. I then de-evolved any symptoms that I received for free until the whole world was infected. Again one the world was infected I dumped my DNA into the symptoms until I reached total organ failure. This time I devolved the transmissions and was able to get necrosis which seemed to help speed the death rate. First person dead 1 year 6 months. This time the death rate shoot up quick with only 12% cure rate. Total 630 days. 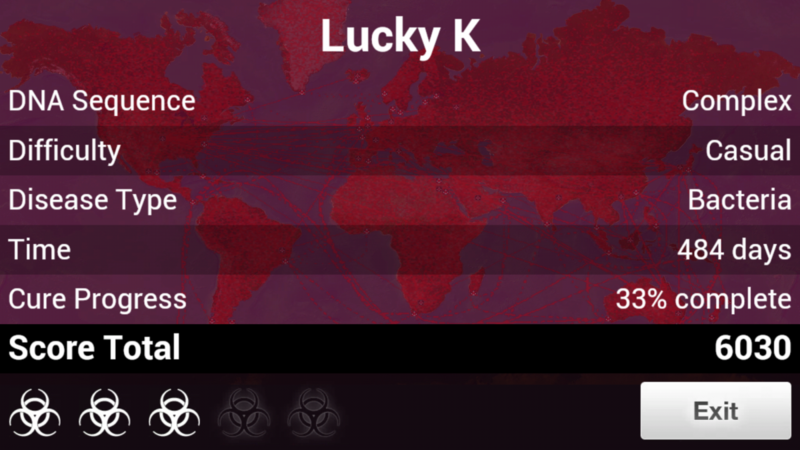 Although I played this as a game to beat, I believe it really shows just how dangerous and easy a plague could spread in today’s society of easy intercontinental travel, and large group gatherings. This entry was posted in Uncategorized on October 19, 2015 by Dourand. In my first game I began in Angola. Th name of the disease was called Vanilla. It started on October 19,2015 and the first 100 people were affected by December 17,2015. By March 18, 2016, 1,000,000 people were infected. The first death occurred on November 19, 2016. There were barely import and exporting on ships or flights coming in and out of the country. The plague didn’t destroy the human race and the disease was eradicated in 586 days. A cure was found and started helping the infected people. In the second game I started in the USA. The name of this disease was Chocolate. By January 5,2016, 100 people were infected. On May 1,2016, a million people were infected with Chocolate. The first death occured on October 5, 2016. By November 17, 2016, no more healthy people were on earth. It took a long time because the ships were using cleaning techniques and had high prescription medication usage fighting off the infection. No cure was found and the human race was destroyed. Angola spread and infected 1 million people within five months. USA took 7 months to spread to 1 million people. USA had a lot of ships traveling in and out of the country. They also had many flights going in and out of the country. 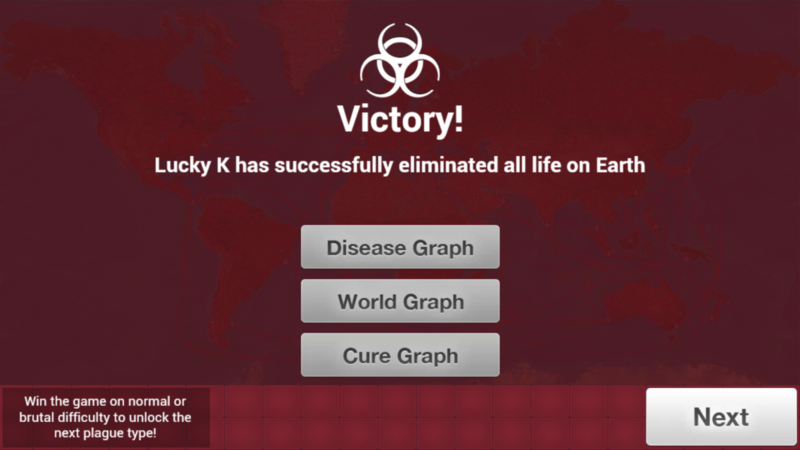 The disease was spreading all over the world. 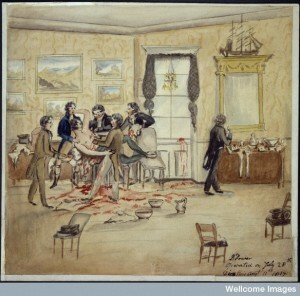 Even though different techniques were given to control the spread of disease, the bacteria strain grew stronger and was able to still spread. In each game I played I conquered Greenland. 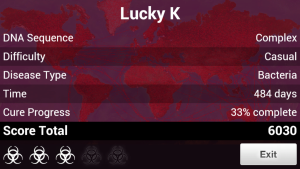 This game definitely showed me how pandemic transmission occurs. It was amazing how fast these diseases spread within a few days and how far they could reach. My diseases went world wide and even killed the whole world. It’s scary how one strain of bacteria can do so much damage if it isn’t contain properly and in an orderly fashion. Once the disease becomes a pandemic it is almost impossible to control. This entry was posted in Uncategorized on October 19, 2015 by Gabby.